On Friday 5th April 2019 the head of the Irish Government, Taoiseach Leo Varadkar (5th from the left), and his entourage visited the Great Southern Trail Greenway tunnel at Barnagh; 7km West of Newcastle West on the N21 road. More than three decades after the Great Southern Trail Group was established, one of its founder members and current chairman, Liam O’Mahony has been invited to address the conference of the European Greenways Association on the issue of citizen involvement. The conference, which takes place in Spain next week, has attracted participants from countries all over Europe including a speaker from the Department of Transport and Tourism who will outline the Irish strategy in developing Greenways. Speaking to the Limerick Leader in advance of the conference, Mr O’Mahony said the building of an underpass to Barnagh Tunnel, currently underway, was to be welcomed. The application by Kerry County Council for funds to develop two stretches of the old Great Southern railway line from the Limerick border to Listowel and from Tralee to Fenit was also a positive, he said. But he questioned whether there was “joined-up” thinking between the Kerry and Limerick councils on the matter and argued that an opportunity was being missed to e develop a national greenway. “It appears that both councils are working independently of each other” Mr O’Mahony said. “Kerry is not even using the Great e Southern tag in their two projects. “Both councils have also failed to highlight that the railway route is 100km long,” he pointed out. He is also concerned that the momentum that was injected when Limerick City and County Council took over management of the Limerick trail in 2016 has faded. But the group persisted in its plan, gradually doing stretches of the line and gained recognition. Now, Mr O’Mahony feels the group is again being ignored. “Now everybody seems to be consulted except us’ he said. “Anything suggested by us has been put on the long finger,” he said. And he includes in this, a suggestion from the trail group to site artefacts of railway heritage along the route. These include old wagons, wheels etc. which could be adapted to new purposes but would serve as reminders of the past. The group however, is particularly concerned about preserving the integrity of the line. “When the GST Group was developing 40km of the old railway line in Limerick, it prevailed, despite trenchant opposition form some sources, in preserving the integrity of the route,” Mr O’Mahony said. This is totally unacceptable to the Trail Group, he continued, and could set a precedent for further deviation in the yet to be developed stretches of the line. “Our position is clear: State-owned railway routes are not up for grabs by private individuals.” he said. Offaly County Council has unveiled a new stretch of Greenway on the Grand Canal and revealed further plans to connect the county all the way to the West with similar projects. A 4km stretch at Srah, Tullamore, was officially opened yesterday by Minister for Rural and Community Development, Michael Ring, councillors and staff from Offaly County Council and Waterways Ireland. This latest 4km section was constructed in partnership with Waterways Ireland at a cost of €170k, funded from Offaly County Council’ and an allocation from the Tullamore MD General Municipal Allocation. Greenway, connecting Tullamore with Lough Boora Discovery Park. This will serve to connect two of Ireland’s Ancient East sites, namely Tullamore DEW and Lough Boora Discovery Park. Construction is ongoing on this section of the Greenway. The Waterford Greenway has proven a tremendous success but the challenge now for local tourism interests is to encourage visitors to stay longer in the area, according to Waterford City and County chief executive Michael Walsh. Speaking on the first anniversary of the opening of the 46km walking and cycling route from Waterford city to Dungarvan, Mr Walsh said that the Waterford Greenway had the potential to transform tourism in the region. “The Waterford Greenway has had an incredible economic, social and cultural impact on all the communities which straddle the 46km-long route. It has captured the local and national imagination and has been a huge magnet for visitors to this region. The Waterford Greenway has taken first prize in a national competition aimed at encouraging community initiatives. The Waterford Greenway scooped gold for the Best Tourism Initiative in the All Ireland Community and Council Awards organised by Local Authorities Members Association and iPB Insurance while it also took a Grand Prix Award for 2018. Over 200 people of all ages had a most enjoyable 10km walk or cycle along the old railway from Barnagh(N21) to Newcastle West on Wednesday 27 December 2017. The event was organised by the Great Southern Trail, the voluntary group that campaigned, developed and managed the Greenway until 2015). We were blessed with the weather on the day, crisp and bright. It was great to meet old and new faces including participants from our neighbouring counties of Kerry and Cork along with visitors from further afield. Thanks to Phelim and Margaret of Coach House Travel and Pat Liston, our driver, for transporting everyone to the starting point from where the view over the Golden Vale was at its best . The walkers then had an easy downhill stroll along the Greenway which was in pristine condition thanks to the work of Joe O’Connor and his team in Limerick City & County Council along with the Rural Social Scheme personnel. The newly installed bilingual townland signs were also favourably commented upon. After a walk of about two hours Triona Dore and her staff at the Longcourt House Hotel ensured that everyone had a nice cup of tea/coffee to wash down the seasonal mince pies. This was the largest ever participation in the Christmas walks/cycles organised by the GST over many years and we wish to thank the local papers, radio and parish bulletins for the generous coverage they have always provided to GST events. Bliain Nua Sonasach daoibh uilig i 2018. In 2018, please God, the GST hopes to organise a similar walk/cycle from Barnagh to Abbeyfeale once Limerick City & County Council have reconnected the wonderful Barnagh Railway Tunnel to the Greenway. [At present the tunnel is a ‘stand alone’ feature and only accessible from the N21 Layby at Barnagh]. 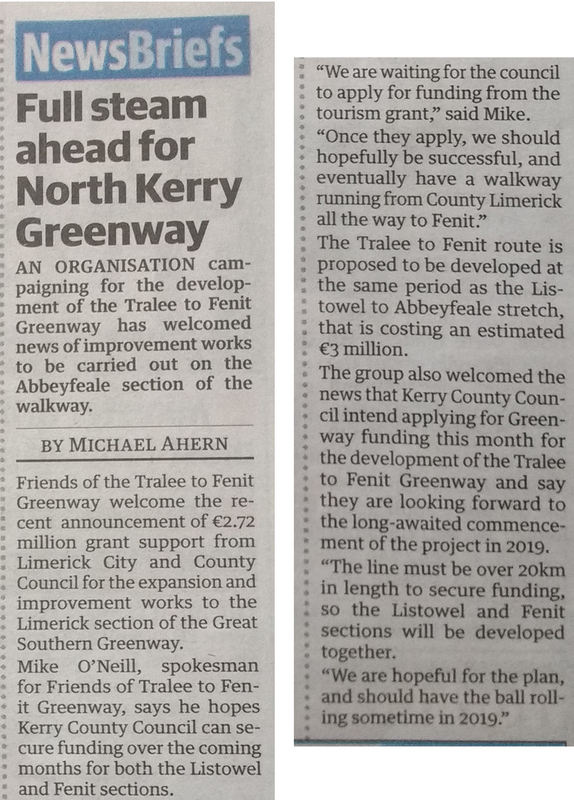 With Kerry County Council preparing to continue the Greenway to Listowel 2018 could also witness an Abbeyfeale to Listowel walk/cycle and we encourage our Kerry supporters to contact their public representatives on the necessity to not alone link Listowel to the Greenway but to continue westwards to Tralee and Fenit along the old railway that Kerry County Council have already purchased from CIÉ. Greenways revitalise rural communities; one need only visit the Waterford Greenway to witness that at first hand. Finally, the GST is hoping to visit the Mayo Greenway on Bank Holiday Monday 7 May 2018: The group will be limited to 40 people with the cost being €60 including breakfast/evening dinner and coach travel from Newcastle West but not including bike-hire. Email lomahony@hotmail.com or phone Pat Condon 06962344 if interested. This event will take place exactly a year after the last public event, a year which has seen little progress on the project yet again ! It is also 6 years since the first public support walk in 2011, this time we are calling on people to get on their bikes to demand the development of important facility. Meet at Saint Brendan’s church Rock Street for a 2.30 departure for cycling leisurely cycle to Mounthawlk and back. This is a family friendly event for young and old and all abilities but if you don’t fancy cycling please come along and walk. Spread the word and lets make the greenway happen, hopefully next year we can cycle to the beach.